A special package for those just getting started. 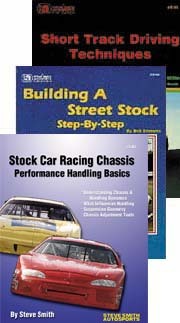 Buy the #S301 Stock Car Chassis Perofmance Handling Basics, #S144 Building A Street Stock Step-By-Step and #S165 Short Track Driving Techniques together! Special Performance Pack is only $45.95.